I like to spend a lazy weekend cooking up a few things I can have for dinner during the week without having to rush home and start from scratch. This is one of those recipes – chicken baked in the oven with fresh tomatoes and herbs out of the garden or farmers’ market. It’s also easy to make for company and won’t keep you in the kitchen very long. I’ve dubbed this dish “Chicken Margaret” after my daughter AKA New in NOLA Margaret. Tip: Rosemary grows like a hedge in New Orleans. Grow one in a pot or in your yard (if you have one). 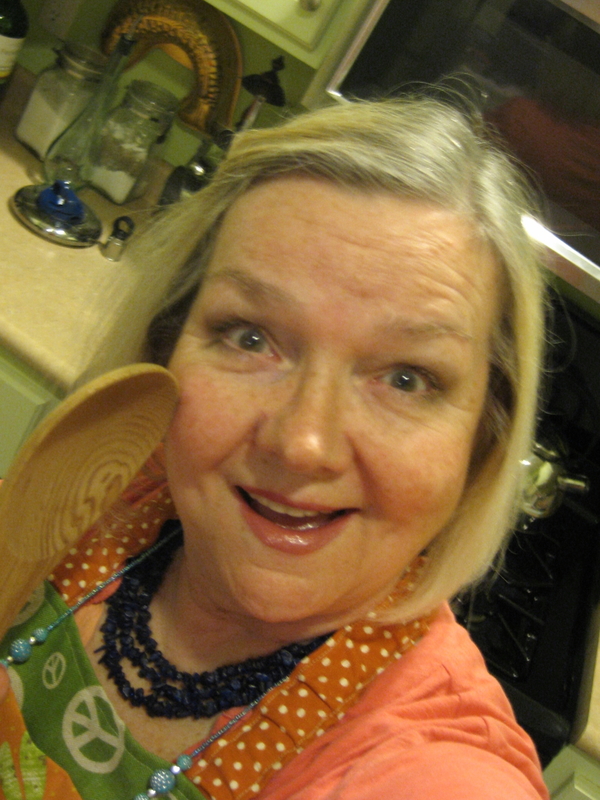 Leave rosemary alone and it”ll do fine. If you don’t want to grow one, find a neighbor who has one. Usually, neighbors are happy to snip off a few sprigs for you – but ask before you cut anything. On cutting board, slice onion into 1/4-inch strips across the grain, as if you’re going to make onion rings. 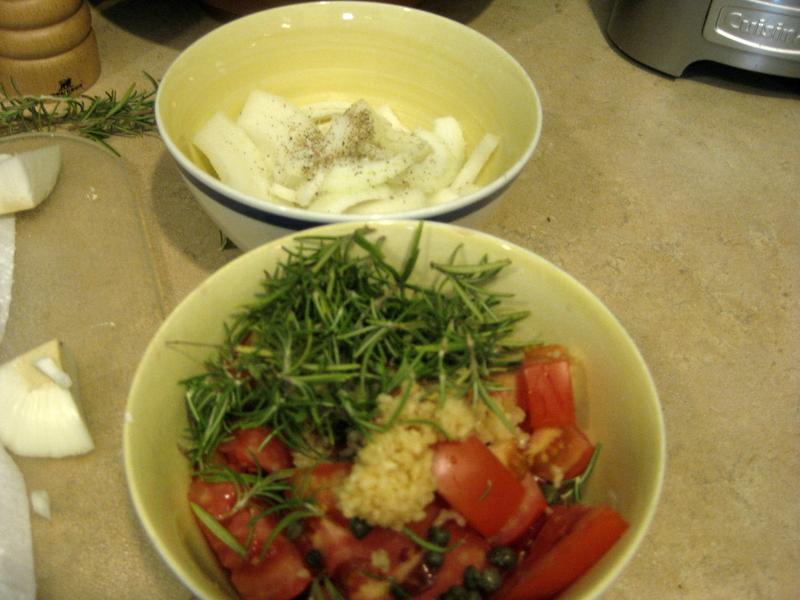 Place onions and 1/4-cup rosemary leaves in one cereal bowl, add a little black pepper and salt. Slice the top off your tomato and cut down lengthwise and across to make quarters. Then slice across for 1/2-inch wedges. 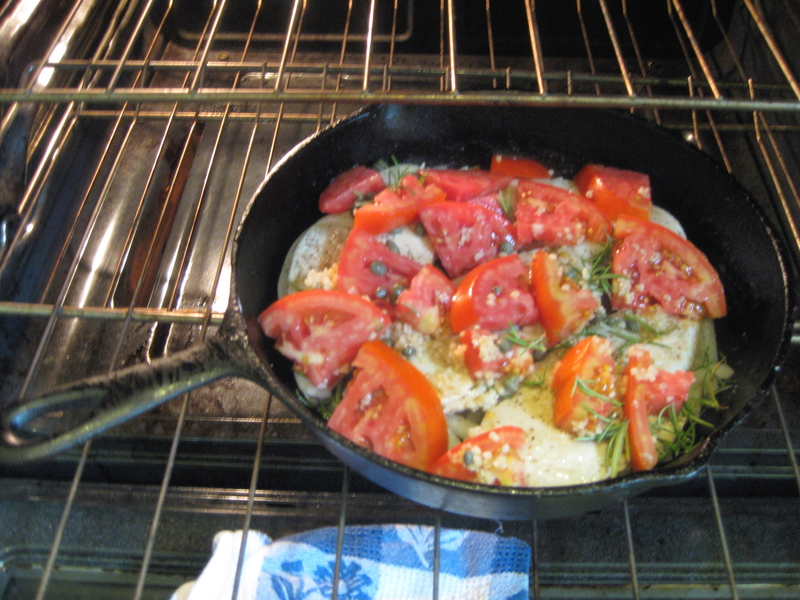 Place tomatoes into the other cereal bowl with capers and garlic. Pour about 1/4 cup of olive oil over the tomato mixture. 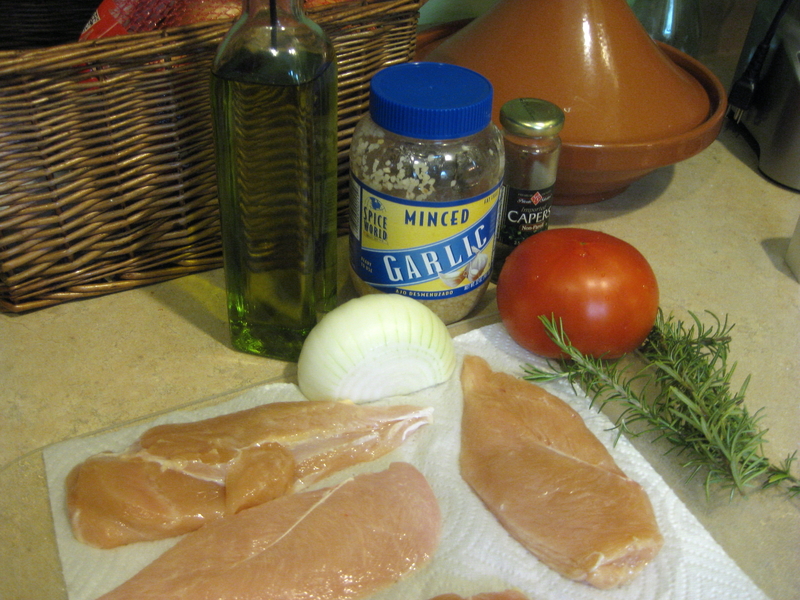 Rinse and trim chicken breasts. Pat dry (important step for getting a nice sear on your chicken). 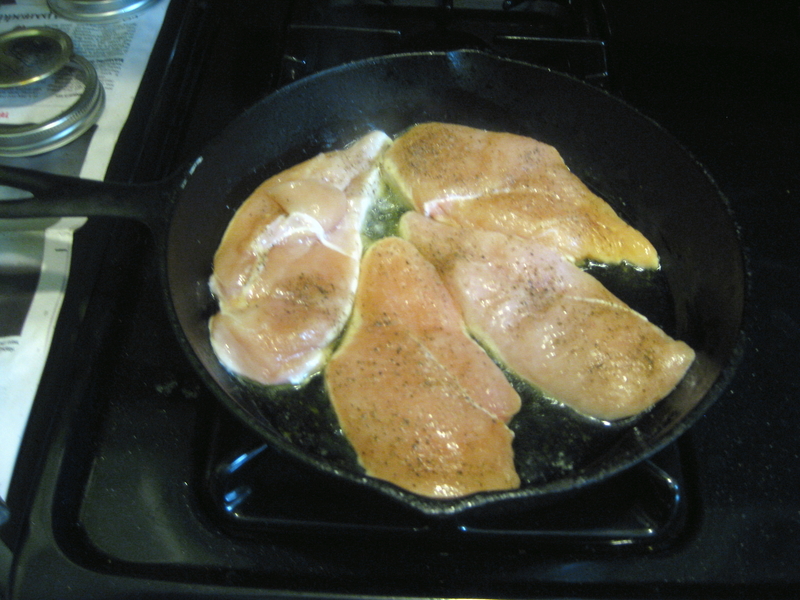 On a plate or cutting board, salt/pepper the bottom of chicken breasts, then turn and repeat. Heat iron skillet, then when it’s hot add 1/4 cup olive oil. Spread around in skillet, then add chicken breasts, top-side down. Let cook about 2 minutes. Remove to plate. 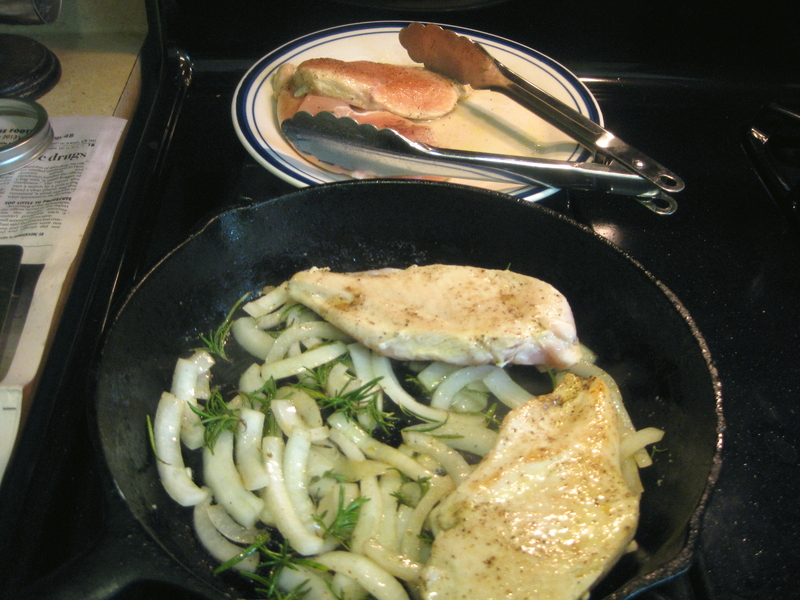 Add onions/rosemary into skillet and saute about 2 minutes, then add breasts back with cooked side up. 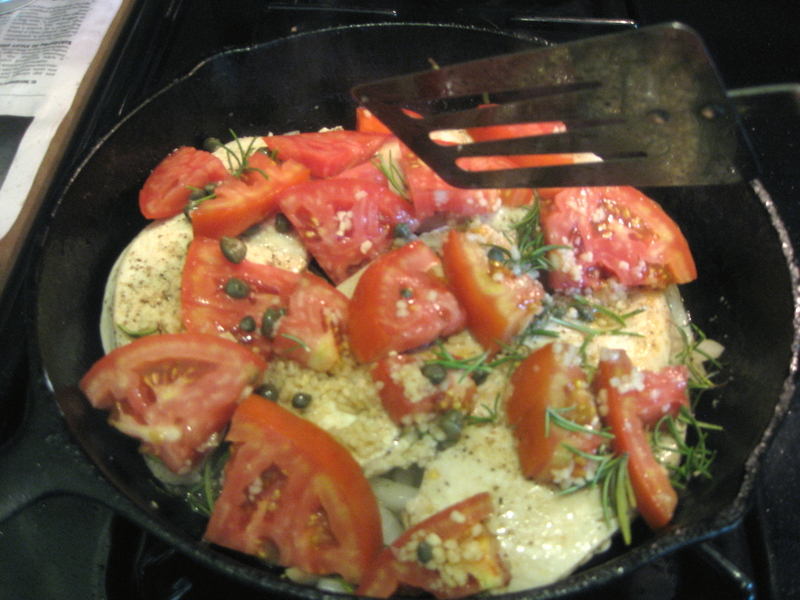 Top breasts with tomatoes, garlic, capers and olive oil. Spread evenly atop breasts. Put skillet into oven and bake for 30 minutes. 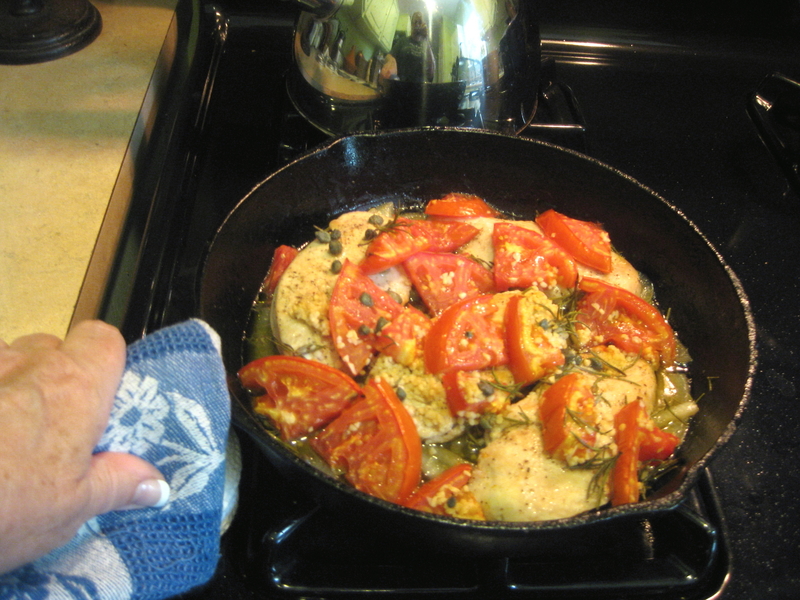 Remove from oven and let rest on your stovetop about 5 minutes before serving. Serve with a salad or a favorite summer side dish like field peas or squash.